Harkening an era many regard as “simpler times,” the swaybacked roofs, arched doors, turrets and leaded glass windows define the fabled storybook mansion homes of the Bay Area. As a practitioner of this whimsical style, Oakland architect W.W. Dixon built several communities of these fanciful homes (although his style was subdued and less ornate than others), including those along Ross Street in Rockridge. My clients, a couple with two young sons, own one of these unique dwellings and needed a solution for providing more functional living space, while maximizing each room’s purpose and use. They approached Amato Architecture to interpret their vision of a spacious, modernized kitchen and multi-use room, and optimize the home’s indoor/outdoor integration – without changing the fabled home’s character. Cramped and inefficient, the original kitchen was set at the back of the house and largely unseen. These cook’s/maid’s kitchens were separate from the household quarters, as was the fashion of the time. To update the space we removed several walls and expanded the floor plan to include an existing breakfast nook; added French doors with a wedding cake stairway leading to the back yard; and opened a wall to an interior hallway. We also took full advantage of the roof’s steep pitch. Above the new kitchen sink, an awkward play space the boys had outgrown was reconfigured into a functional upstairs cupboard. Reclaiming this attic area, dubbed “the slanty room,” allowed us to vault the kitchen ceilings and add timbers, mimicking the home’s great room and preserving the visual and period architecture. Each of Dixon’s Ross Street homes contains a distinctive theme. My client’s was an American settler wagon train motif possibly depicting the ‘49’er migration west. We preserved these hand-carved details, as well as beautifully intact, bespoke leaded glass cabinet doors, re-purposed in cupboards above the computer workstation. 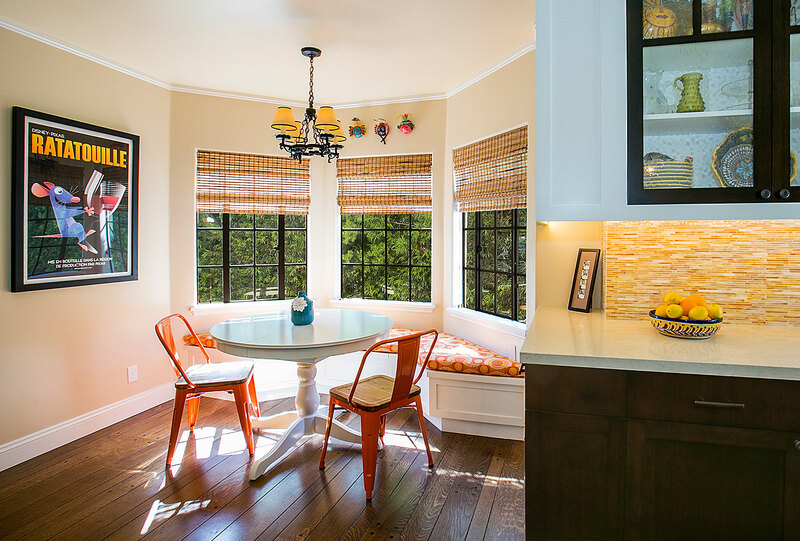 To further increase the kitchen’s functionality and keep countertops uncluttered, we specified cabinetry that would serve multiple purposes and complement the repurposed vintage glass panels. Next to the stove large, deep drawers disguised as cabinets, keep skillets and pans tidy and easily accessible – a vast improvement over the dark, hard-to-reach, under-the-counter norm. The computer workstation’s top drawer houses a pullout keyboard that also tucks away neatly when not in use. Another distinctive characteristic of Dixon’s style was the use of arches – in ceilings, doorways, and nooks. We opened a hallway off the kitchen to connect an existing powder room and laundry room utilizing a sweeping, asymmetrical arch. The organic curve leading to and from the kitchen softens the predominantly angular space and unifies Dixon’s original vision. The new archway access also unites the two halves of the home, creating a functional, multi-purpose space anchored by the kitchen’s large island countertop. This popular location gets used by everyone – for morning coffee, lunches, buffets, or as homework central depending on the family’s needs. A few steps down the hallway, a newly remodeled laundry room also doubles as guest room. To add functionality and convenience for visiting friends and family, my clients opted to add a shower to the adjacent powder room. We were unable to salvage the existing tiling, however the newly installed finishes provided the perfect balance of modern and rustic to bring all elements of the home together. The old laundry room – another cramped and underutilized area was transformed into a multi-functional, multi-use space – part guest room, laundry room, game room and music studio. Appliances hidden behind beautiful cabinetry with large counters above for folding, disguise the room’s original purpose. Secret chutes from the boy’s room, makes sure laundry makes it way to the washer/dryer with very little urging. Lastly, the guest room’s newly added French doors open onto a raised, covered patio furnished with comfortable outdoor- and kid-friendly seating. The low maintenance landscape replaced a neglected and unstructured yard, to create a convivial extension to the family’s living space. Surrounded by realistic faux grass, this new outdoor room has become the family’s de-facto living room – where Dad can watch the game, the boys can shoot hoops, and Mom can dream up her next fairytale remodel project.